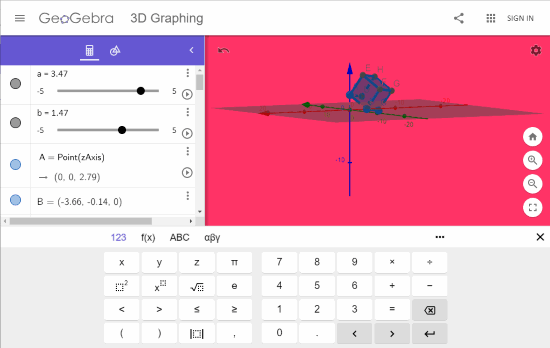 Here are 4 free online 3D graphing websites. You can plot surfaces, build solids, graph functions, vectors, points, etc., depending on the feature provided by website. After that, you can check the plotted item in 3D view on the interface of website. The 3D graph is visible separately and you can also do the changes and update the graph. Each website on this list has some good and unique features also. For example, you can download 3D graph as image, SVG, PDF, etc., save graph online, zoom out and in graph, share graph, show/hide grid, axes for graph, and more. Let’s check these free online 3D graphing websites one by one. GeoGebra is one of the best 3D graphing websites to plot 3D functions, surfaces, draw solids, and do other things. It comes with a lot of features which make it stand apart from the crowd. There are so many tools which include points, polygons and lines, planes, circles, curves, measure tools (for angle, length, volume, etc. ), special lines, etc. Use tools and you can see the graph on the right part in 3D view. Using this website, you can plot a new 3D graph, save a graph online (needs free account), and export graph as PNG image. The option to download graph as PDF, SVG, PGF, STL, HTML file, etc., also present that you can use as per the needs. While previewing your 3D graph, you can also set options for 3D Graphics. For example, you can show/hide planes, axis, grid, change projection type (Orthographic, perspective, etc. ), change background color, etc. This is definitely a better online 3D graphing option and you should try it. Mathpix is also a nice option for 3D graphing. You can plot points, equation, parametric, vector field, and vectors. You can add as many items as you want but the output might not come as expected. So, it would be good to plot graph with one or two items. 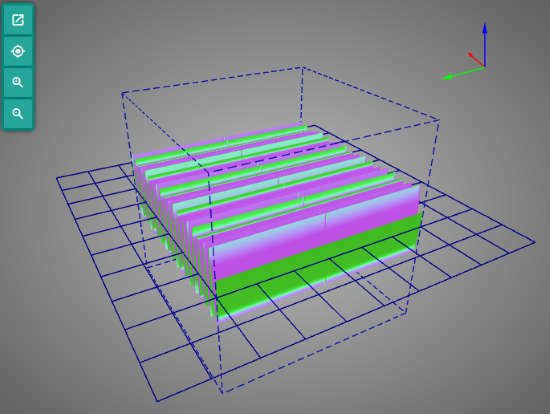 The 3D output is visible on the right section on its interface. This website also brings zoom in and out options for 3D graph and option to export graph as 3D file. But, these options didn’t work for me. Maybe, there is some bug on the website or there was some other problem on my end. So, you can at least give a try to these options and see if these work. Otherwise, the website is only helpful to plot 3D graph for lines, points, etc., and preview it. Intmath.com provides its separate 3D Grapher tool. Here is the link to that tool. 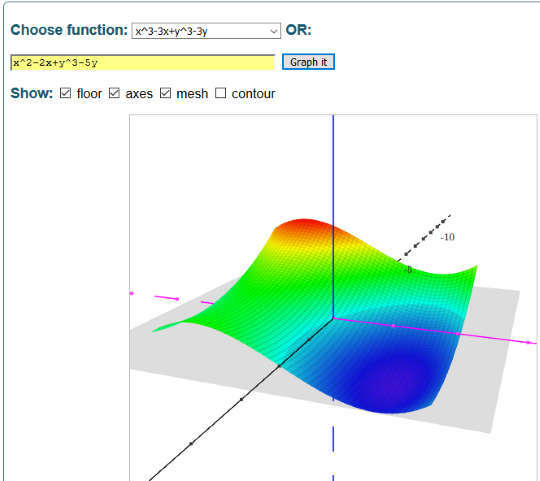 Here, preset 3D graphs for different functions are present. You need to select a function using the drop down menu and it will present preset values and graph based on the selected function. The good thing is you can change values and update the graph accordingly. If you don’t want to use present function, then you can also use the available field to add custom values to plot points, add exponential, trigonometric functions, etc. Add values and see the 3D graph. You can show/hide axes, mesh, floor, etc., for graph. Unfortunately, you can’t save graph online or download it. The website is only helpful for practice and test purposes. 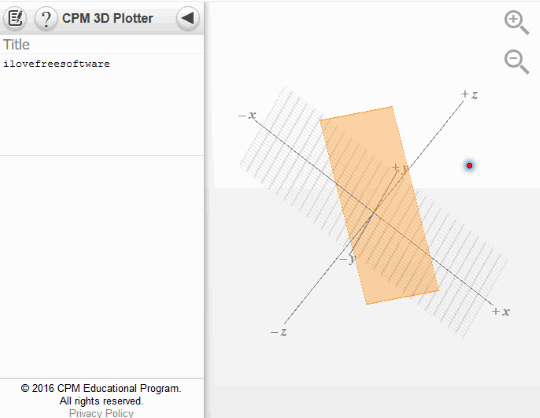 CPM 3D Plotter (Homepage) provides a nice interface where you can graph planes and points and then see the output preview on 3D axes. The website is not helpful to plot other graphs but a handy option to plot 3D points and 3D planes graph. On the interface, there is a left section to add values and plot the graph. And the rest of the interface shows the 3D graph. You can’t download the graph but it lets you save graph online. Your saved graph is stored publicly and a unique URL is created for that graph. You can save that URL and also share it with others. If you need some best free 3D graphing software, instead of websites, then check this list. So, these are some nice options available as online 3D graphing to plot functions, points, planes, vectors, and other graphs. Though I was expecting the feature to download 3D graph to PC but not all of these websites are capable of that. So, in terms of features, “GeoGebra” is the best. It lets you create and save graphs to PC, download graphs as SVG and other supported document formats, share graph, and more.